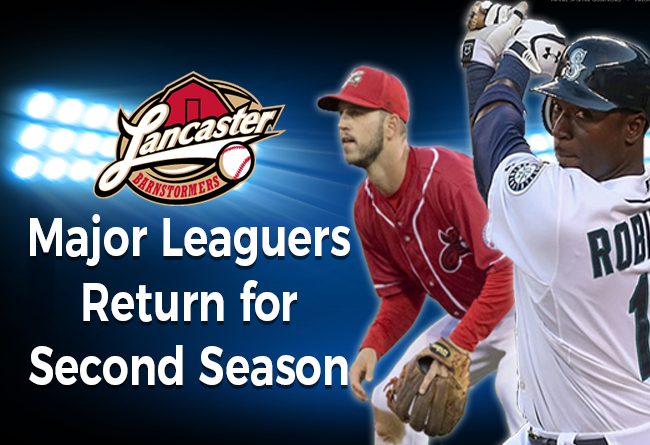 (Lancaster, Pa., Feb. 20, 2017) - Outfielder Trayvon Robinson and second baseman Jeff Kobernus will both be making a return to the Lancaster Barnstormers in 2017, it was announced today by manager Ross Peeples. They are the 11th and 12th players signed to contracts for the upcoming season and the second and third to return from last year’s squad. Robinson, 29, was acquired from the Somerset Patriots in a late season deal. The switch hitting outfielder from Los Angeles batted .298 with six homers and 20 RBI in 51 games as a Barnstormer and .261 with 15 homers in 115 games overall in the league last year. With the Barnstormers, Robinson batted .338 (24-for-71) over his last 21 games, scoring 16 runs while driving home 11. The former Seattle Mariner also stole 25 bases between Somerset and Lancaster in 2016. Originally signed by the Los Angeles Dodgers in 2005, Robinson batted .300 and above in their farm system in 2009 and 2010 and clobbered 26 home runs for Albuquerque in 2011. However, it was a three-team, seven-player deal late in the 2011 season that sent Robinson to Seattle and earned him his first big league callup. Robinson played 90 games at the Major League level over the next two seasons. He hit five home runs, among them long balls against former Cy Young winner Jake Peavy and one-time Barnstormer Jerome Williams. “Trayvon did a great job when he came over last year, both on the field and as a leader in the locker room,“ Peeples said. Kobernus, 28, batted .295 and stole 22 bases in just 55 games with the Barnstormers in 2016. He homered once and drove in 22 runs while scoring 32. The Oakland, CA area native’s playing time was limited due to nagging hamstring injuries. The Cal-Berkeley product signed with the Washington Nationals in 2009 and reached the Major Leagues in 2013. Along the way, he won two stolen base titles, leading the Class A Carolina League with 53 larcenies in 2010 and the Class AA Eastern League with 42 in 2011 while playing for the Harrisburg Senators. The following year, he stole 42 for Class AAA Syracuse, finishing second in the International League behind Cincinnati Reds speedster Billy Hamilton. He appeared in 28 games with Washington, picking up five hits, one of which was a home run off former Cy Young winner Cliff Lee. Kobernus spent 2015 in the San Francisco Giants system. The Lancaster Barnstormers are entering their 13th hseason as a member of the Atlantic League of Professional Baseball. Home games are played at Clipper Magazine Stadium in downtown Lancaster, Pennsylvania. Please call 717.509.HITS (4487) or visit www.lancasterbarnstormers.com for more information.